Mathematics evokes images of numbers and symbols – biology graduates see it (or are assumed to see it) as a dry, complicated, and abstract subject. However, the learning of biology (particularly the fields of ecology and evolutionary biology) has a strong component of mathematical reasoning to it. Biology teachers often struggle to make mathematics interesting. Studies have shown that relating statistical concepts to real-world problems or using physical objects to demonstrate concepts could be effective tools to increase student understanding. Recently, a group of ecology educators added colour to explaining applied statistical concepts using sweet candies! Most ecological fieldwork involves estimation of species population and species diversity. These estimates tell how the population of species changes over time and area. Decreasing populations signal a species is not doing well, and may require interventions to help them thrive, allowing for planned conservation efforts. The population estimation exercise includes capturing a sample of animals, marking and releasing them back into the wild so that they mingle in the population. After a passage of time, another group of animals are captured. Some of these would already have been marked, and some not. 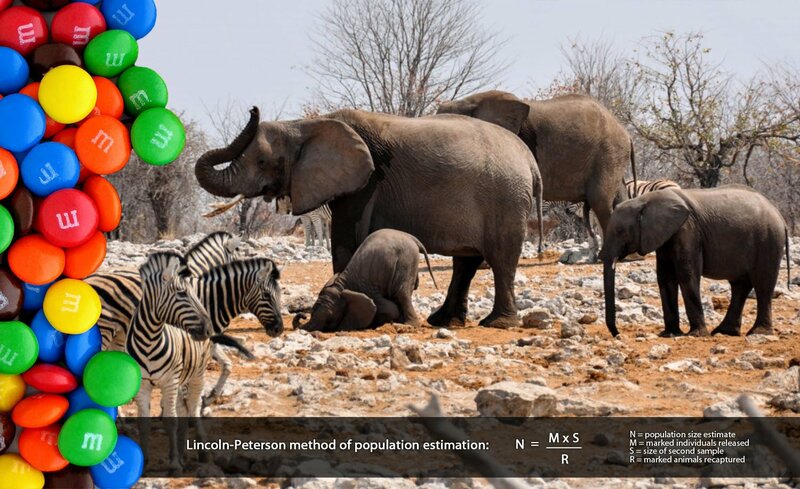 This exercise leads to population estimation - based on the fact that the number of marked animals captured is proportional to the number of marked animals in the entire population. This method assumes that the size of the population does not change during the study period. A new study reports using M&Ms, similar to Cadbury Gems, to teach population and diversity index - key concepts in ecology. Colourful candies can be used as a good substitute when field-based learning is not possible. Each pack of candies represents a closed community, that is, no candy enters or leaves the pack. The different colours can represent different species in a community. Students are divided into groups and each group is given a package of candy. Each group pours the candy into a container with a lid and counts the number of candies of each colour. The colour with the highest number of candies is noted. Closing their eyes, the students pick a few candies one by one. Candies of the colour with the most number are marked, either by scratching lightly or using a non-toxic marker. The candies are returned to the container and shaken well to redistribute them. The same number of candies as chosen the first time is again selected. The students then count the number of marked samples obtained during the second picking. Using appropriate formulae (Lincoln-Petersen index) students can estimate the population index. Once this exercise is completed, they can join groups, combining their candies to mimic a larger population size and recalculating the population index. This would provide them an understanding of how population size affects estimates. By extending the exercise further, the diversity index, i.e. number of different species of animals in the community can be calculated (Shannon-Weaver index). The diversity index is based on the idea that in a very diverse community, if you pick one member, the probability that the next member will belong to the same species is low. Training of mathematical reasoning in biology is important, with specialized fields such as bioinformatics, theoretical biology, and mathematical modelling contributing to a rising proportion of biological research. In India, there has been a significant growth in curriculum in mathematical biology at the post-graduate level. However, the question remains - how to make mathematics less of the seemingly abstract stuff and more about the concepts that students can easily relate to. Innovative ideas are needed for biology students at the high school or undergraduate level, who at least in India, traditionally have had a less rigorous mathematical curriculum.